Weight loss is a bigger deal than ever, and scientists are continually weighing in on what works and what doesn’t work. Unfortunately, the quality of research on this topic is highly variable, and so are the results. Here is what a good study looks like and what the results tell you about eating right for healthy weight loss. You will be pleasantly surprised. A randomized clinical study ideally compares groups of human subjects that are randomized (i.e., not predetermined) for variables that may bias the results. Although that may sound a bit complicated, the gist of this approach is to assemble groups that are as equal in every way as possible. In so doing, any differences between them at the end of the study are due to treatment effects, not experimental bias. Bazzano, L.A. et al. (9 additional authors). 2014. Effects of low-carbohydrate and low-fat diets: a randomized trial. Ann Intern Med. 161(5):309-18. Indeed, the title tells you something about how the subjects were grouped (i.e., randomly) and what the treatments were for comparison (i.e., low-carb vs. low-fat diets). Lots of other details are important, although at this point you already have a pretty good idea that these researchers were looking for comparative effects between two diets. The two diets were: 1) low-carb, defined as fewer than 40 grams of carbs per day; and, 2) low-fat, defined as less than 30 percent of daily energy from fat, including less than 7 percent of daily energy from saturated fat. The researchers were looking for effects on weight, body fat, and blood lipids (ratio of total cholesterol to HDL cholesterol; triglycerides). Measurements on each of these effects were taken at 0, 3, 6, and 12 months. Data along a time curve like this give a clearer picture of how fast the effects of a treatment can occur and how long they can last (up to 12 months). A particular strength of this study was that it was ‘long-term’ – meaning 12 months. Randomized trials like this rarely extend beyond about 12 weeks. Graphs are like pictures – they tell you as much as a thousand words. The key graphs that compare different effects between the two diets are below. 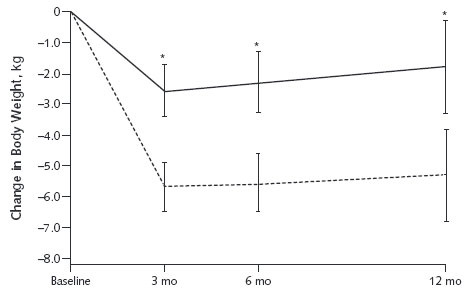 In each graph, the solid line indicates the low-fat group and the dotted line indicates the low-carb group. 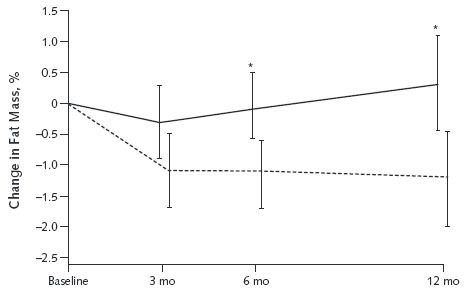 At 12 months subjects on the low-carb diet had greater weight loss by an average of 3.5 kg (loss of 5.6 kg on low-carb vs. 1.4 kg on low-fat). 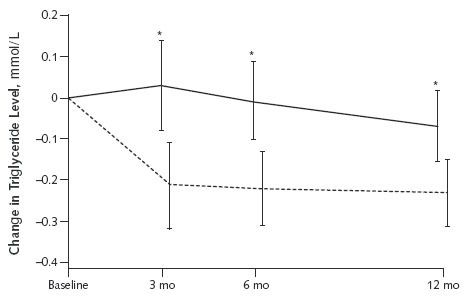 At 12 months the low-carb group had greater reduction in fat mass by an average of 1.5 percent (drop of 2.6 percent on low-carb vs. 0.4 percent on low-fat). At 12 months the low-carb group had a greater drop in the ratio of total cholesterol to HDL cholesterol by an average of 0.44 (drop by 0.71 on low-carb vs. 0.16 on low-fat). 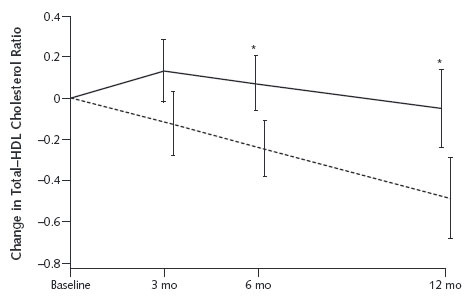 At 12 months the low-carb group had a greater drop in triglyceride levels, by an average of 14.1 mg/dL (drop of 27.4 mg/dL on low-carb vs. 0.8 mg/dL on low-fat). Restricting carbohydrate is the best option for persons seeking to lose weight and reduce cardiovascular risk factors. If a diet is ‘low-something’, then it must also be ‘high-something’ if total energy intake is kept constant. Just considering the low-carb diet, this means that the other two food groups, protein and fat, must make up for reduced carb intake. Likewise, low-fat requires that carbs and protein make up for the reduced fat intake. In this study, low-carb was accompanied by an increase in fat intake, and low-fat was accompanied by an increase in carb intake. Such interdependent variables seem to confound the experiment. However, we are stuck with this issue in all dietary studies. In addition, both groups in this study reduced their caloric intake from the beginning by about 500 calories per day. This is an additional variable that complicates absolute interpretations of the results. Nevertheless, even with these criticisms, it is clear that low-carb eating is preferable to low-fat eating for weight management, fat metabolism, and blood lipid control. The good news is that this means dietary fat is good for your health. Isn’t it nice that fat is the tastiest of the three food groups? 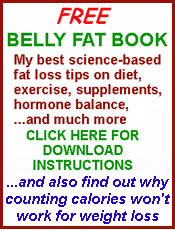 After all, most of the truly enjoyable flavors in foods are soluble in fat. Take advantage of flavorful fat by tossing out the dogmatic recommendation to ‘eat lean’ for good health. Based on this study, it should be ‘eat fat’ for good health. 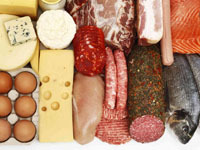 CAUTION: There are, of course, many kinds of fats, proteins, and carbs. The sweeping generalization to eat more fat, therefore, comes with its caveats. Which fats? How much of each? What sources? These and many other questions are important to answer before you willy-nilly start cramming yourself with lots of fat every day. These questions, along with many other pieces of advice about fat, are topics that I have included in my explanation about the biology of fat in my ebook, Fat Loss Biology: The Science Behind Why We Get Fat and How to Lose It. You can click on that link to get a better idea what this book will tell you about getting slim and staying that way for life. Meanwhile, go ahead and enjoy chicken dark meat with skin, steak with lots of marbling, eggs, bacon, juicy pork chops, and all manner of tasty foods that provide health-promoting fat. what are your thoughts on the plant based diet called Forks over Knives? Highly deficient in basic nutrition.